WAIST HIGH: Blame It On Bakersfield Yes. But Buttonwillow? Blame It On Bakersfield Yes. 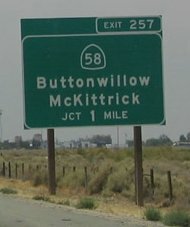 But Buttonwillow? Seems Scott Peterson told lie after lie after lie following the disappearance of his wife. (contracostatimes.com) "He said he was in Bakersfield, but it was Berkeley. He said he was in Buttonwillow, but again it was Berkeley. He said he was in Fresno, yet police traced him to Berkeley."